The DNX408v2 includes many of the new and improved parts Team Durango has developed for the DNX408 over the past year. With a new fuel tank, radio box, combined PT (personal transponder) and throttle mount, stronger bumper and diff case, tougher shock diaphragms and wing mounts, the DNX408v2 is ready to take your racing to the next level. All of the new parts have been tried, tested and approved by our team of drivers and professional engineers to give you the winning edge. 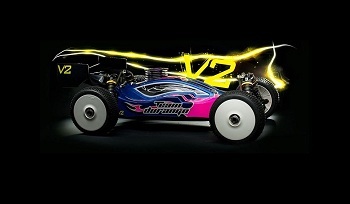 Combined with race-proven features from the original car, the DNX408v2 is Serious About Racing. New for the DNX408v2 is this improved fuel tank. The pressure pipe has been relocated from the side of the tank to the lid, resulting in more consistent pressure inside the tank. Also, the neck of the fuel filler has been re-profiled to work with the Team Durango fuel gun (#TD390082) and other aftermarket fuel guns. Finally, the v2 fuel tank is made from a high-transparency material to make it easier to see exactly how much fuel is inside your tank. The all new radio box has much more space for you chosen receiver, which means you can make your wiring as tidy as possible. The aerial is now mounted to the part of the receiver box that stays in car, so even when the receiver box lid is removed, the aerial stays in position. The v2 receiver box has a cool hinged door for inserting and removing the receiver batteries. This means that the batteries and receiver compartment are now fully independent. The new combined personal transponder (PT) and throttle mount has improved stiffness and rigidity. By relocating the PT holder, you now have much easier and improved access to the brake-bias linkage, making alterations faster and uncomplicated. The new PT holder now stays fixed to the removable radio tray, so the whole assembly can be removed for ease of maintenance. The tougher bumper positively locates onto the front diff cover, making the bumper extremely durable. It is just as easy to remove the front differential as it was before, but now the whole front bumper/diff case assembly is a lot stronger. The v2 diaphragms have been re-profiled and made slightly thicker to prevent them from tearing. This also gives your Team Durango big bore shocks more consistency and feel, especially over long finals. Again, we have increased the strength of these items. By reducing the number of mounting holes to two (high and low, as used by our Pro racing team) we have been able to dramatically increase the strength of this part. Diff tuning is a big part of 1/8 nitro off-road racing, so like our World Championship and Reedy race winning 10th scale car (DEX410) we made diff access super simple on the DNX408v2. Not only are you more likely to get your diffs optimised on even the tightest of race schedules, there is no risk of upsetting your suspension set-up when removing and replacing your diffs. Machined alloy bearing holders and a ‘floating’, stress-free, diff case assembly make for a truly low maintenance, long-life, maximum power transmission system. Designed to have a low centre of gravity (C of G), the DNX408v2 gives you the confidence to push for PB lap times, without falling-off the race track. Team Durango’s precision machined one-piece engine mount prevents crankcase flex and engine problems. Our gold memory-mount plate means if you need to take if off the chassis it ‘remembers’ precisely the gear mesh setting. Big bore and beautiful. Team Durango’s 15mm big bore shocks keeps your DNX408v2 planted, and with our optional shock spring sets (#TD230019 and #TD230020), you can be sure to get the right set-up for any track and condition. Moulded rubber boots and splash-guards help you finish your race, even on the dirtiest tracks. Low-maintenance and reduced wear of CVDs and shock shafts are another benefit of being booted and booted. A 5mm thick lightened chassis, only 104mm wide, precision machined alloy bulkheads and careful positioning of the engine mount and centre bulkheads makes for a super-strong central spine of the car. Both centre drive shafts are the same length, which means fewer, different, spare parts required in your pit box. The brake piston pushes exactly on the middle of the brake pad, and the all-machined bulkheads and brake-pad mounts result in zero flex and maximum feel. The steering bell cranks follow the line of the suspension kick-up, preventing unwanted bump-steer.